First week went very well. Although there were some hot and uncomfortable days that I had to train on, I made it through the discomfort. Sunday I ran 4 miles, and in doing so, I went somewhat off the beaten path. I do that sometimes to shake the monotony of running the same familiar routes. It allowed me to tune out my brain, and take in the sights. I discovered some huge houses and nice hideaways. The elevation was not extreme at all, which gave me a more relaxing longer run. Sadly I encountered way too many stray dogs. I hate that these poor creatures are on the street. They left me alone for the most part, and a couple were more afraid of me, than a threat. People really need to be mindful of their animals, and to spay and neuter them. I hope that in my future training runs, I don’t have to encounter so many lost little souls. Speaking of strays, we rescued another one on Friday. This sweet girl was wondering around our neighborhood for over a week with an unfixed male. She was extremely friendly, and even sat for a couple of photos, so I could get the word out about her. The male was not as social, and was too skittish and aloof. We were not able to catch him. When we got home from work on Friday evening, the lost girl was laying in a yard three houses down. When she caught eye of us, she bolted full speed to our place. I made the decision to give her a home. She adores everyone in the house! The other dogs are happy with her and love her too. She makes a great playmate to our puppy, and they wrestle for hours. We had our vet check her out, and she is in perfect health. She just needs to be fixed, and that will be done within the next few weeks. Puppy-boy is first. So running aside, please spay and neuter your pets. Also please consider a shelter dog; rescues make the BEST companions! 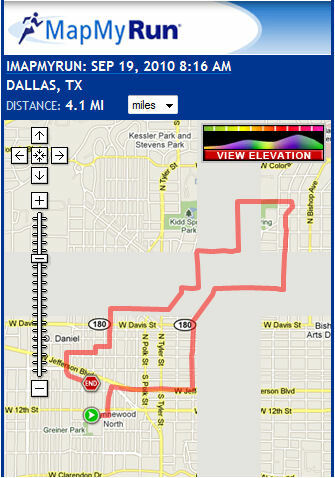 Completed (Run): Distance 4.02 mi, Duration 0:48:31, Pace 12:05 min/mile, Speed 5.0 mph. Week one of Half-Marathon training is upon me! Day one… a rest day. I can dig that! I put in a little over 4 miles on Saturday morning, and my legs were noticeably heavy. Not quite sure what the exact problem was, but I am thinking it was due to lack of proper hydration and supplementation; a wagon that I have fallen off of as of late. I am a preacher of drinking water. Drink at least your 8 cups (64 oz) of water a day, and more than that during the summertime. The injury got me off my game with training and with the above theory; I have just not been cognitive of my water intake. My food intake, yes I have been mindful of, but hydration has been forgotten. Bad me! I made it through the run, but did have to walk almost a mile at the end. Walking breaks are fine, but when it is something that you have to take suddenly, due to performance issues, you have got to look at the “why”. Today I am looking at training schedules. It was easy with the marathon training because I had a couple of books that were dedicated to the topic. However with a Half Marathon it is a little more tricky to find solid tried and true advice. It’s out there, but you have to weed through the web to get it. I believe I am settled on one of Hal Higdon’s. I may just be overly cautious due to the fact that I am coming back from an injury. I’m going to take this slow. REPEAT. I am going to take this slow.